Will I Ever Learn My Lesson? This time, I added 2 egg whites and a scoop of peanut butter to the oats to give them some staying power, and paired them with a pear on the side. The oats were really thick and creamy and delicious. I also drizzled some honey on them and cooked them in almond milk. Surely I’ll be starving by 10:00, but I was just craving a hot bowl of oats this morning! I need to talk about my fitness plan. I’m feeling overwhelmed by my fitness desires lately. I want to do more running, and I also want to keep up with the Jamie Eason LiveFit Trainer (which I put on hiatus over the holidays), and as of today, I really want to get back to going to my group fitness classes, but it just doesn’t seem like there are enough hours in the day to meet all of my fitness wants. This morning, I went back to the 6:15 Cardio Fusion class at my gym. I used to attend this class incredibly regularly, but I stopped going altogether after the half marathon and starting the LiveFit Trainer. Hold wall sit, then raise each leg for 8 reps. Then hold wall sit again for 2 8 counts. Whew!! My heart was pumping and I sure was glad to reach the stretch portion of this class! This workout made me realize how much I miss going to this class. It’s so nice to wake up, throw on my workout clothes and shoes, and just go to the gym. No need to make a plan, no need to make sure my phone is charged, no untangling my headphones. However, I am loving the muscle building that is going on with LiveFit. As much as I love my class, it’s more of a fast-paced, low-weight, high rep class with emphasis on fat burning. I need to figure out a way to fit it all in with running as well. Which means that I won’t be following LiveFit strictly anymore. I think because the Cardio Fusion class meets 2x a week, I can probably fit in one of those days. Since I made two fitness resolutions (run 600 miles this year and make a specific strength training plan each week), I will have to sit down and figure out how to fit it all in. I will keep you updated! I had to fit our cabbage in yesterday, and what better way to do that than with sauerkraut!? I made smoked sausage sauteed with peppers, onions and kraut, the Pioneer Woman’s crash potatoes, and roasted broccoli. It was so delicious, and I feel luckier already! Do you ever feel like you can’t fit in all the different kinds of workouts you want to do? 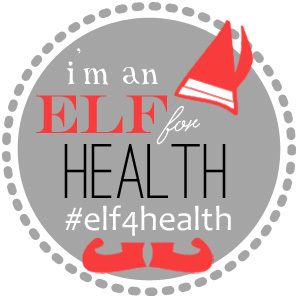 I haven’t talked about #Elf4Health on the blog in a few days, but I’ve definitely been following the challenges! I have a great new elf, Kim (you can find her here), and she’s been pretty awesome about tweeting at me and keeping me on task. I may have mentioned that I’m feeling a bit under the weather lately, so it helps! Today’s challenge was to eat 3 servings of veggies before 2:00 PM. Now, I am the queen of the veggie breakfast scramble, but with the addition of cardio into my daily LiveFit Training, I was running late this morning and totally forgot about the challenge. A salad topped with a lentil veggie burger (the salad also had carrots, cucumbers and tomatoes), roasted brussels sprouts from last night, and raw broccoli with a side of cheese. Yum! 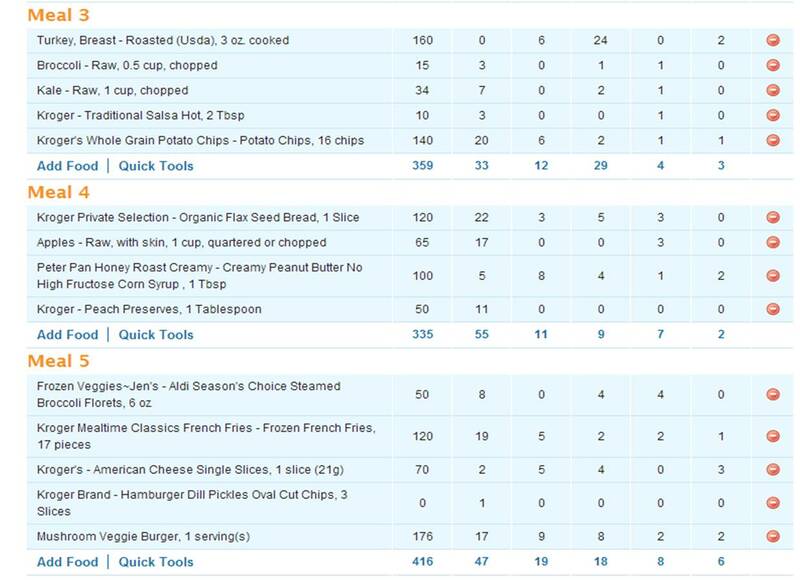 So, I definitely had my 3 servings before 2:00 PM! Success! The above image was created by me in Gimp. I’m trying to teach myself to use it, because I can’t afford to pay someone to redesign this blog when I need it. As you can see, I have quite a bit of work to do! In other news, the LiveFit trainer workouts are getting pretty intense. I’m turning into a pro of the weight room…with some help. The guy who works the early shift in the weight room has basically become my new BFF. He doesn’t shy away from showing me how to do the exercises I’m doing wrong, and this morning he was my spotter. I had to do 5 sets of bench press: The first set as a warm up, three regular sets of 8, and then one negative set of 3-5. Uhhh, I had no idea what a negative set was before today! Negative Set: A negative set loads the weight beyond your maximum and only performs the exercise in the muscle lengthening (or eccentric) movement. FUN! That’s what a negative set is. I did my warm up set with just the bar (45 lbs), then loaded it with 10 more pounds for my regular set. For the negative set, we put another 10 on (65 lbs!! ), and started at the top of the movement. The goal was to lower the weight as slooooowly as possible, and then he would raise the weight again for me. It was awesome! I felt like the strongest girl in the world! Have you ever done negative training?